Logs need cutting and splitting now ready for those cold winter months! 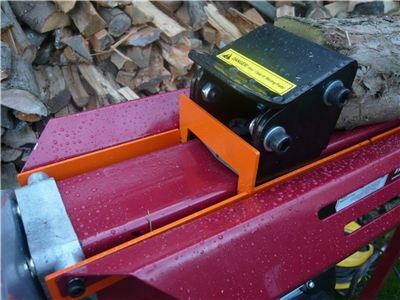 The 4 Ton Hydraulic Horizontal Log Splitter is a great machine and fantastic timesaver for the light home user, turning log chopping from a dangerous chore into a safe, easy automatic operation. The Titan-Pro 4 Ton Log Splitter is a durable machine and is on sale for £189. Iif you have larger or knotty wood and require a higher power threshold, please look at our 6 & 7 Ton Titan Pro log splitting machines. Titan Pro Horizontal Log Splitters are quiet in operation and can split all logs including seasoned and "green" wood, like a hot knife though butter in just seconds! This means you can prepare, dry out and store logs at anytime of the year. If you need somewhere to store your logs, check out our Wooden Log Stores selection! UPGRADE TO A 6 TON LOGSPLITTER HERE. OR GO FOR THE FULL 7 TON RAM FORCE HERE. All units are supplied with a full UK warranty and spares back up service. Dont forget to order your Gloves - they are a must when using Hydraulic Log Splitters! 4 ton splitting power provided for the hydraulic log splitter, see our higher spec models for more Umph! The provided price for the 4 Ton Handy Log Splitter includes VAT! Please note delivery time is 3 working days to UK mainland. Please look at our NEW patented Titan Ram Stop attachment that is available. It‘s a fantastic piece of kit that allows you to adjust the return, so it will save you a lot of time if you have smaller logs or woodburner. Watch the video for the 7 Ton Log Splitter in action HERE. *Please note no stand is available with the 4 Ton machine. Also see our small protective cover for our range of electric log splitters! Got my new 7 Ton Log splitter today and really very impressed excellent quality the stand makes all the difference to ease of use. I bought the Titan Pro Seven Ton Hydraulic Log Splitter to split pine logs freshly cut. I had done about a cubic metre in an hour and the work is absolutely effortless. The Seven ton splitter makes very easy work of the logs including knots and its simple to set up and use. just unpack familiarize yourself with the manual pug in and go. Working withing twenty mins of delivery. This product is in my opinion extremely good value for money Titan Pros competitors charging the same money for a splitter only around half the power. The product is superbly engineered and I wouldnt hesitate to recommend this product to those who slpit their own logs for personal use. I hope this will be useful to you. Could you let me have some idea of when the stand is likely to arrive please. Thanks Titanmy 4 ton splitter arrived to day.What a fantastic bit of kit does exactly what it says on the can and what a pleasure to not have to swing a splitting axe however I wish I had gone for the 7 Ton Model my friend has one and is a different beast to my one serves me right... might look to upgrade next year.